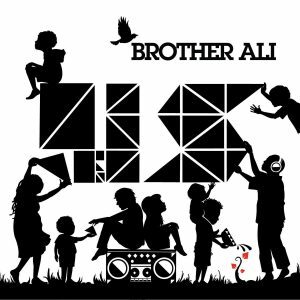 Brother Ali’s latest album, Us, cements him among the greats in hip-hop. Photo courtesy of thelmagazine.com. Brother Ali is quickly rising in the ranks of rappers out today, giving weight to his claim on “Life Sentence” that he is “one of the greatest of all time.” As a legally blind, albino Caucasian, Ali offers a unique perspective through his music. He speaks about how his condition made him a social outcast from his white classmates after which he turned to black culture and rap music as an outlet. Born and raised in the Midwest, Ali formed close ties with many rappers from the booming Minnesota scene, most notably Ant and Slug from the acclaimed group Atmosphere. Any fan of Slug will undoubtedly enjoy Ali’s flow and attitude, which bears a strong resemblance to his counterpart from the Midwest. Ali is currently signed by Rhymesayers Entertainment alongside other notable artists, including Blueprint and Eyedea. In 2003 Ali released his first record titled Shadows On The Sun for distribution around the Minnesota metropolitan area. It was not until The Undisputed Truth came out in 2007 that he gained national recognition and climbed to number 69 on the Billboards. In Truth, Ali narrates custody struggles and homelessness as an aspiring rapper. Brother Ali’s latest album, Us, cements him among the greats in hip-hop. In his third and best album to date, Ali makes a profound statement on the human condition without taking to the political soapbox many underground artists gravitate towards. The album released last September reached number 56 on the Billboard charts. Us is not an ode to bling, but rather explores universally-shared struggles in rap music today. For the normally serious Ali, Us is a remarkably easy listening experience that most rap fans will enjoy. What makes the album truly special is its comedic undertone infused in the otherwise emotional tales. The story of his present life focuses on his family and their modest wealth, a humble approach that’s refreshing. The only thing the album lacks is replay value. In many of the tracks Ali recounts his life stories, which are powerful listening experiences the first couple times through, but can become trite very quickly. However, Brother Ali’s latest album is an excellent addition to any music collection and should not be passed up by any fan of rap music. Be sure to keep your eye out in 2010 for Brother Ali, as he will surely be crossing over to mainstream success after his latest hit album. Thanks for writing this review man. I appreciate it. We’re announcing a show in DC this spring. If you get a chance you should come through. I dig what you’re doing with rap today and taking it one step further, which is truly awesome. I saw you open for Slug at 930 last year and have to say it was a great performance. You already know I’m catching you guys when you come around this spring. P.S. Is there any way I can say whats up to you after the show?